HOW HARD IS IT FOR A GOOD MAN TO GO BAD? Ex-marshal Billy Reynolds (Dale Robertson) is sent to Devil's Canyon state prison in Arizona - charged with killing two brothers, although in reality it was in self defense. He soon learns that killer Jessie Gorman (Stephen McNally), a third brother of the two dead men, is in the same prison and has vowed revenge! 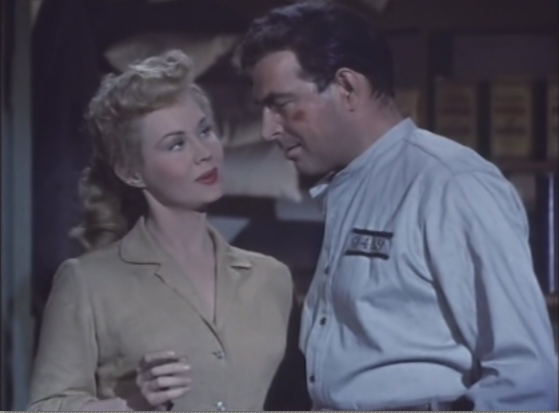 Complicating matters further is the incarceration of Gorman's girlfriend, Abby (Virginia Mayo looking absolutely gorgeous) who helps Gorman plan an escape while at the same time is unsuccessful hiding her feelings for Reynolds. 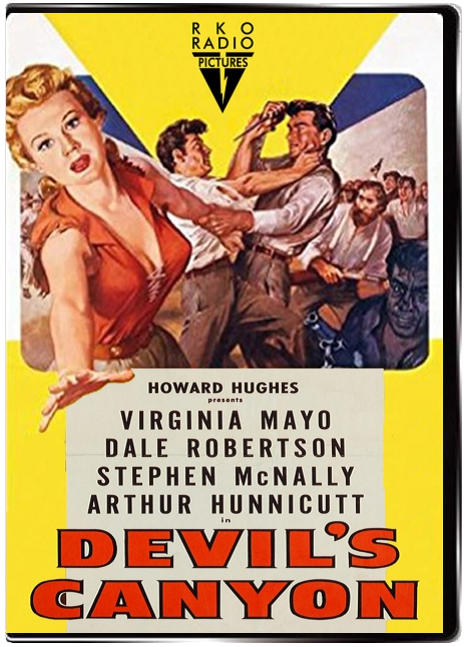 Devil's Canyon is directed by Alfred Werker and collectively written by Frederick Hazlitt Brennan, Harry Essex, Bennett R. Cohen and Norton S. Parker. It stars Dale Robertson, Stephen McNally, Virginia Mayo, Robert Keith, Arthur Hunnicutt, Jay C. Flippen, Whit Bissell and Earl Holliman. Music is by Daniele Amfitheatrof and cinematography by Nicholas Musuraca. 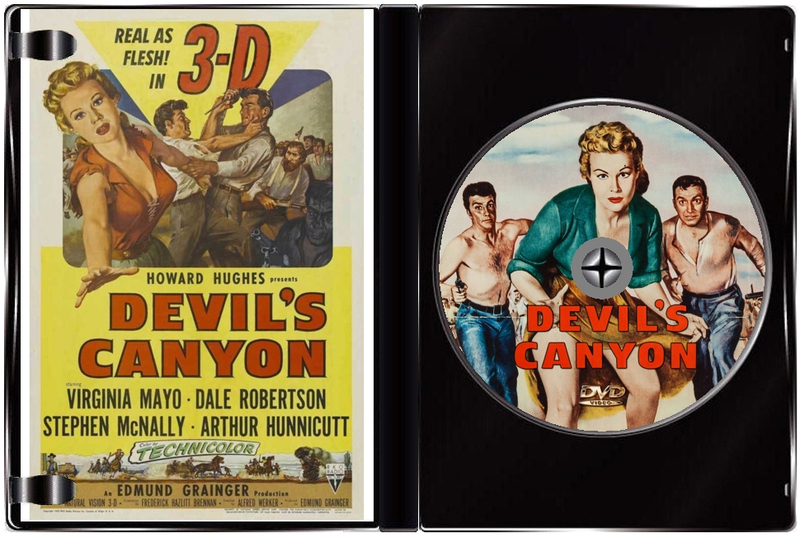 Originally a 3D production out of RKO, boasting Natural Vision 3 - Dimension no less, Devil's Canyon can now only be viewed in Technicolor flat mode. Some have made the claim that the title is a reference to Virginia Mayo's, uummmmm, birth canal, since there is no canyon anywhere in the film and this indeed would fit in with the way Howard Hughes was marketing films at the time. 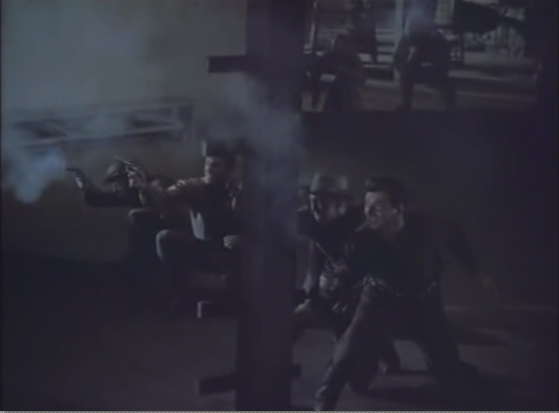 However, careful viewers will note that Devil's Canyon is actually the name of the prison where the action takes place. 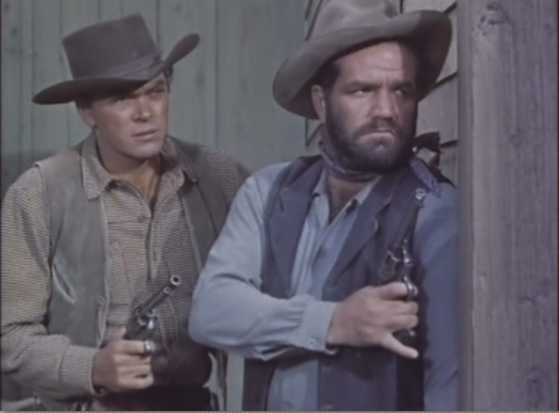 The movie features a number of notable character actors from the era, including Whit Bissell, Morris Ankrum and Irving Bacon, but only Dale Robertson, as the upstanding hero, is given much of a character, while Mayo's feminine charm and grace are front and center for a good chunk of the picture..